EVERYONE IN THE VILLAGE IS TALKING ABOUT THE CHRISTMAS FESTIVAL. MATTI TOLD THE GINGERBREAD BABY. "I CAN SING IN MY GINGERBREAD BAND!" THE GINGERBREAD BABY SANG OUT. Matti points out that his Gingerbread Baby doesn't exactly have a band. But that's no hindrance for these two master bakers, who quickly mix up a batch of ginger cookie dough and shape them into band instruments, who bounce right out of the oven and begin to warm up as soon as Matti adds the detail of strings and keys with decorative frosting. Matti hitches up his cheerful hen to the sleigh and the band rehearses all the way to the little Alpine village, where the festivities are already in progress. Gingerbread Baby and his gingery musical mates take the stage and start their spicy serenade. The townspeople begin to dance to the sweet waltz music. But then one sharp-eyed girl in the audience steps up close and peers at the jolly musicians. "I THINK THESE INSTRUMENTS ARE REALLY COOKIES!" SAID ANN-SOPHIE. Oops! Gingerbread Baby and Matti had planned on providing music for the festival, not refreshments! "Silver stars twinkle in the night. Silver trees and snow delight! Hand in hand we twinkle around. Twinkle in the magic sound." Unnoticed, the gingery instruments slip behind the stage, where Matti quickly scoops of handfuls of snow and converts the cookie instruments into covert jolly snowmen, and loading them on his sleigh and giving his draft chicken a quiet Giddyup, the clandestine musical snowmen disappear from sight into the night. And meanwhile the Gingerbread Baby himself cleverly takes cover in plain sight amid the Christmasy decorations on the giant village tree, in author-illustrator Jan Brett's third Gingerbread Baby story, Gingerbread Christmas (G. P. Putnam's Sons, 2016). Brett saves an even bigger treat than cookies for her fans, with a enormous two-page pop-up Christmas tree, filled with bright decorations and one Gingerbread boy, bravely trying to blend in. It's another jolly and bright Christmas story, illustrated in her signature style with plenty of red and green and predictive side panels and frames which forecast what happens next for sharp-eyed readers, in yet another illustratively attractive classic Christmas tale for the best-selling Brett. 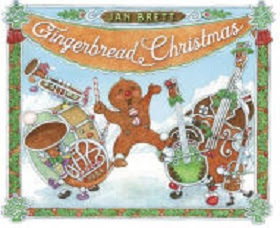 Other popular Christmas tales by Jan Brett include The Wild Christmas Reindeer, The Night Before Christmas by Jan Brett, (2011-11-01), The Three Snow Bears, and Who's That Knocking on Christmas Eve? THE ANGEL SAID, "DO NOT BE AFRAID. I BRING TIDINGS OF GREAT JOY." The little angel, her halo almost in place, takes her place before the closed curtain and delivers her proclamation, while the curtain twitches and two excited little faces peep out at the assembled audience of proud parents. 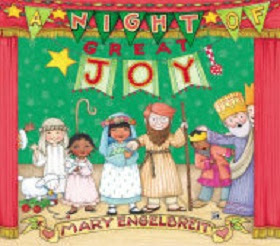 What is better than a children's Nativity pageant to lead off the celebratory season, and in her characteristic style, Mary Engelbreit delivers her own introduction to the holiday in her A Night of Great Joy (Zonderkidz, 2016). Engelbreit's portrayal of the presentation of the annual Christmas performance features her trademark rosy and chubby-cheeked youngsters of all sorts, some serious, some shy, and some a bit silly, with Mary arriving on stage in a little red wagon with a toy horse head mounted on the front, pulled by a little red-haired Joseph sporting a bristly beard. The babe in the manger looks a lot like somebody's well-loved Raggedy Andy, and a rocking horse stands quietly by, while the plump little actor in the cow costume dozes off beside him. The Three Kings, appropriately crowned and gowned, appear gravely with all the dignity they can summon, as two shepherds scuffle a little over who possesses the toy sheep and the angel choir has a little to-do over their places. At last the Star rises and the choir, finally sorted out, stand still to sing the old, old song. There's no reason why a presentation of the Adoration cannot be adorable, and the latest Engelbreit title joins her earlier catalog of Christmas confections--Mary Engelbreit's Nutcracker , The Best Christmas Ever With Mary Engelbreit, The Big Book of Santa and of course, her classic The Night Before Christmas. Each morning when Fletcher bounded out of the den, everything seemed just a little bit different. The rich green of summer was turning to dusty gold. And Fletcher the little fox becomes disturbed about what is happening to his favorite tree. "I think my tree is sick," said Fletcher. "What is wrong?" "Don't worry. It's just autumn," said his mother. 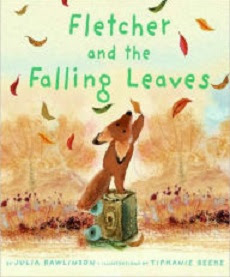 The tree's leaves are turning russet and brown, and when the first one falls, Fletcher runs to catch the leaf and poke it back into the tree trunk. But the cold wind soon sends many more of the leaves whirling down and away. "Don't worry, tree. I'll catch them for you!" Fletcher promises. But Fletcher can't keep up with the swirling, falling leaves that spin out of sight. He sees that he cannot keep his promise to the tree. At last only one leaf clings to a twig. When it falls, he sadly takes it home and makes it a cozy little place to sleep. But just before dawn Fletcher wakes and tiptoes outside where the tree stands cold and alone. But it's not bare; in the moonshine, Fletcher sees that his tree is hung with shimmering icicles that twinkle like the starlight. In Julia Rawlingson's Fletcher and the Falling Leaves (Greenwillow Books, 2016, rev. ed. ), the author wisely lets little Fletcher experience fully both the grief of the changes time inevitably brings and yet the hope for what is to come. In this revised paperback edition, the artist Tiphanie Beeke aptly offers lovely new impressionistic illustrations, done in softly pointillist watercolor style, with an emotional depth that heightens the punch of Rawlinson's premise and with her final page filled with a glowing illustration of the bare but beautiful, shimmering tree, perhaps a promise of the yet unspoken spring to come. Says School Library Journal, "Picture books about nature sometimes suffer from cloying, excessively pastoral language or imagery; this rare example succumbs to neither." And Kirkus Reviews adds, "A poetic tribute to winter and fall.... sure to resonate with young readers." Rawlinson's other sensitive stories of the seasons are Fletcher and the Springtime Blossoms, and Fletcher and the Snowflake Christmas. Eggs and toast and a glass of O.J. start the day. There's a peanut butter and jelly sandwich to munch for lunch, and juice and crackers are afternoon snackers. And in between Llama Llama goes with Mama to the grocery store for more. Veggies and cheese are sure to please. And back home again, supper is a real slurper-upper, with Llama Llama's favorite. Spaghetti is quickly ready, and with spicy herbs and a sprinkle of cheese, it's always time for "More, please!" And then there's the finale--a dish of ice cream with a cherry on top. 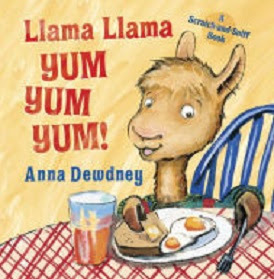 For both picky eaters or young foodies, Anna Dewdney's rhyming Little Llama tale, Llama Llama Yum Yum Yum! (Grosset and Dunlap, 2016), has an extra treat along with little Llama's choices to eat. It's a scratch-and-sniff board book, featuring the smells of favorite foods: sweet and fruity (grape jelly in the sandwich) and sour (a sample dill pickle from the deli counter), tangy orange in the juice, and a hint of herb-y oregano in the pasta, with a cherry-vanilla dessert chaser. Food can be fun, and with Llama Llama, they'll all say YUM. Anna Dewdney's delightful preschool rhymes and charming illustrations are a tasty treat in the little scratch-and-sniff board book just right for a toddler's stocking stuffer. Just be yourself! If being a different color suits you, as Todd Parr puts it, you can be seen as pink, purple, or green! 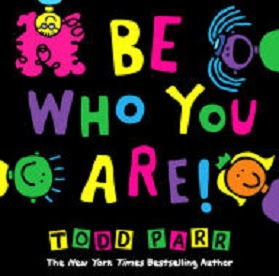 Of course, kids hearing this story are not going to get the opportunity to be purple, but Parr's latest, Be Who You Are (Little, Brown, 2016), does make a plea for trying out being whatever you can be. And Parr's bright illustrations offer a choice of colorful food trucks to try--Tacos, pizzas, noodles! A mouse tries out standing up to a cat, with a firm NO! Parr's illustrations are super-saturated, super silly, and doubtlessly inviting for youngsters who will appreciate a little hyperbole along with their advice for conduct of life, and as a companion to his top-selling companion title, It's Okay To Be Different, Parr's brand-new book, Be Who You Are (Little, Brown and Company, 2016) is perfect for pairing as a read-aloud for preschoolers or an easy read-alone for beginning readers. DUNCAN'S TEN CRAYONS HAVE GONE MISSING! What is sadder than an almost new box of crayons with one missing? A box with ALL the crayons missing! Duncan's crayons are famous for having minds of their own, and it seems that each one in the box of ten has been busy doing its thing. Crayon One has found a wizard who must be PURPLE. Crayon Two turns up, predictably coloring crocs GREEN. Following their proclivities can lead the color detective to the correct crayon. Crayons YELLOW and ORANGE, true to their type, are vying for the honor of tinting the sun. Following the trail, Duncan manages to round up all of them, BEIGE still complaining about being called light brown, and and RED still schlepping apples and strawberries into baskets, and, giving his all to provide everybody's favorite hue, BLUE, worn down and stubbier than ever. What's best of all? 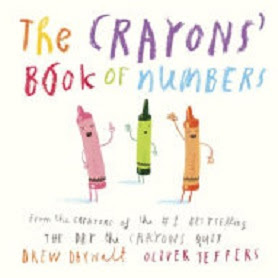 A full box of not-quite-so new crayons and an afternoon of colorful artwork, in Drew Daywalt's and Oliver Jeffer's satisfying crayon hunt, The Crayons' Book of Numbers (Grosset and Dunlap, 2016), as Duncan picks up all his crayons and puts them back in their proper place. Top-selling cohorts Daywalt and Jeffers venture back into the board book genre for this jolly counting book that inspires cleaning up and counting in one fell swoop. With this companion to their recent concept book, The Crayons' Book of Colors, the duo of Jeffers and Daywalt continue their popular series for the preschool set. What's next for these outside-the-box collaborators? The Crayons Color the Seasons? The Crayons Color the Shapes? GROOVY JOE SAW SOMETHING YUMMY. It's going good for Groovy Joe. What Joe sees is a Haagen Dogs ice cream truck. And what he gets is a tub of strawberry ice cream. And a spoon. Life is groovy. GROOVY JOE IS LIVING THE DREAM. But just as Joe sits down to enjoy his cool treat, a tiny tricerotops ROARS into the room, pulls out a spoon and ties on a bib. He's having some ice cream, invitation or no invitation. Does Joe lose his groove? Nope. "IT'S AWESOME TO SHARE!" HE SINGS. 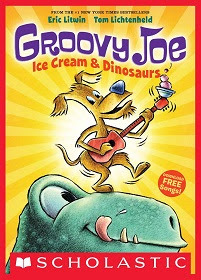 Joe and the little dino dude dive into to their delicious ice cream, but soon there is another rude interruption. ROAR! It's an big dinosaur butting in. He brandishes a spoon and puts on a big bib and pulls up a chair to dish himself a prodigious helping. But does Joe blow his top? No! He repeats his melodic mantra. "IT'S AWESOME TO SHARE!!" HE SINGS. All's well for the moment as the trio chows down on their frozen treat. But then it happens again! ROAR!! A huge dinosaur crashes through the door, Without observing any niceties, he ties on a big bib, plunks down into a chair, and producing a huge spoon, digs right into the ice cream carton. But then there's a predictable problem. The carton is empty. The ice cream is gone. But Groovy Joe chooses to take metaphoric lemons and make lively lemonade. He turns the ice cream carton upside down and turns it into a drum, rat-a-tat-tatting with his spoon, and the three dinosaurs jump into line, dancing to the beat. Even faced with the worst guests at table ever, author Eric Litwin's other cool character, Pete the Cat, would say "It's all good," in his Groovy Joe: Ice Cream and Dinosaurs (Groovy Joe 1) (Scholastic/Orchard Books, 2016). What do you get when you combine best-selling author Eric Litwin with best-selling illustrator Tom Lichtenheld (for Rinkey's Goodnight, Goodnight Construction Site) ? You get the first installment of the jaunty Groovy Joe series, with a message about the virtues of sharing goodies (even with the worst-mannered guests imaginable), and with comic creatures done in Lichtenheld's signature blackline and strong color, creating illustrations that make making the best of a bad situation look like jolly good fun for storytime, with a included link to Joe's cheery chant online. Says Kirkus Reviews, "a catchy tune, dancing dinosaurs, and strawberry ice cream are an enticing combination." "Okay, Darlings, before I turn the page, let me preface this by saying that what you are about to see isn't entirely my fault. Now I know this looks bad, but let a girl explain." Mabel, that doggy diva, is back. A pampered society pet, this social-climbing French bulldog, is thrilled, darlings, to have copped an invitation for a sleepover with her posh neighbors, Smarty Cat and Scaredy Cat. The overnighter comes as a welcome break. Mabel is becoming a bit bored with watching Martha Stewart cooking yet another couscous dish. And then she mistakes a bowl of potpourri for her doggy dish, resulting in a definite improvement in her breath, and, um, other odours, but otherwise no cure for her ennui. So it is with great anticipation and elan that she packs "everything" for the occasion at the mansion of Smarty and Scaredy's mother, the creme de la creme of elite society and academia, the noted paleontologist, Professor Millicent Murgatroyd, Her hostess, however, serves up only old black and white movies for entertainment, not Mabel's cup of tea. But although Mabel comes prepared to see some old bones lying about, she is not prepared for what she does see. One shadowy monster on the wall becomes two, and then the two multiply into many. I knew it was a monster. The room was crawling with them! I grabbed the nearest weapon (Millicent Murgatroyd's walker). She did not seem to appreciate my efforts. Maybe if she cleaned up her house once in a while, it would not be infested with monsters. I decided this wasn't the best time to bring that up! Faced with a strangely rampaging guest lambasting her dinosaur skulls and fancy furniture, Professor Murgatroyd calls Mabel's parents to come for her, and Mabel goes home in disgrace. So much for her high society sleepover. 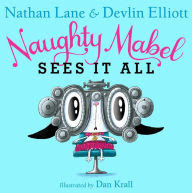 But all is forgiven when Mabel is discovered to have double vision and she is off to the octopotamus for an eye exam and new contacts, in Nathan Lane and Devlin Elliott's second book about a stylish but naughty French bulldog, Naughty Mabel Sees It All (Simon and Schuster, 2016). Although Mabel's self-consciously snooty references to the passe' couscous and potpourri may be marginally funny for adult read-alouders, it will go over the heads of younger readers, and while her slapstick destruction of the neighbor's household may please younger listeners, it may all seem a bit silly to third-graders, but for those many fans of the first book, Naughty Mabel, (see review here) this tale of the diplopic Mabel may be an amusing episode in the life of this posh and pampered pooch. As a bit of reassurance to kids who wear glasses, pair this one with Ged Adamson's quite funny, Douglas, You Need Glasses! (see review here). If I could go back in time and tell my old self that he was going to leave his home, his school, and go on the run from enemy spies--and have to go undercover AS A GIRL--he would have laughed. But I am not laughing. Sam is, though. Loudly. "I can't wait to see you in a tutu." She dissolves in giggles. We're up in my room with the file Mom and Dad gave us to go over, but Sam seems more interested in my new disguise. I ignore her. I want to be a proper spy, and doing well in this job is the first step to making sure that happens. Joe's parents are professional spies, now in a sort of witness protection system which requires deep cover. Mom and Dad are used to this sort of thing, Disguise is their specialty. But for Joe, this is an enormous change! "I've had to go undercover--as a girl. To throw the enemy agents off, Joe has to portray a convincing ten-year-old blonde girl named Josie, complete with sparkly bunny hair clips. Only his best friend Samantha, a.k.a., Sam, knows his real identity, and she comes in handy when he needs some lessons in faking a girly-girl. As his BFF, Sam provides perfect cover. But according to headquarters the counterspy agents are getting too close for comfort, and Josie's parents come up with a double mission for Josie and Sam: Josie will take an intensive ballet class at the local community center to establish his identity as a girl, and the two kids will also be charged with helping foil a rumored planned heist of the Soccer Memorabilia exhibit scheduled at the same time as their dance recital. Josie and Sam are given training and lots of cool spy gear--self-stick eyeball cameras, tamper testers, tracking devices, and a laser mapping wand. Using the ballet class as a entree to the building, they soon have the whole building bugged and are beginning to gather information about the employees. But Josie and Sam settle on different suspects. Josie is sure the swim team director is the true soccer thief, because he hangs around the soccer display a lot and because he tries to recruit Josie and other kids to swim in his swimming match as an excuse to case the Soccer exhibit. Sam becomes convinced that their ballet teacher is the real crook, setting up a loud and raucous finale to their recital to cover the robbery. Sometimes it feels like Sam's better at everything than I am. Sometimes that's a bit annoying. But as they continue to spy on their respective suspects, Sam and Josie discover that they are both right--there are dual bad guys at work in this caper. And together they come up with a masterfully clever switch for the swim meet which foils the counterspy coach's plot to, er, reveal Josie's real identity and endanger him and his parents. There's plenty of suspenseful spy kids sleuthing, spy talk, and clandestine gizmos in Kate Scott's clever Spies in Disguise: Boy in a Tutu (Scholastic Press, 2016), now available in a new American paperback edition tailor-made for the middle reader trade. 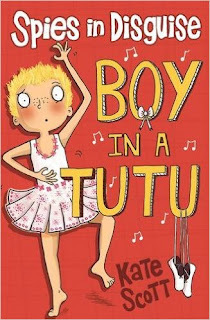 Joe's uneasy role playing a girly-girl with pink kitten hair clips and a sparkly tutu adds some light-hearted humor to the spy-story genre, with just the right hint of real danger to heighten the action. Other books in this series are Spies in Disguise: Boy in Tights and Spies in Disguise: Boys in Heels. NATURALLY, DRAGONS HAVE A BIT OF TERRIBLE IN THEM BECAUSE THEY'RE DRAGONS. BUT THIS DRAGON HERE? TERRIBLE! Dragons are supposed to keep their smoky mischief beyond the pale, properly out in countryside caves, curating their hoards and blasting knights on chargers seeking adventure and fame. But this one? He's just a home-town jerk! HE TOOK CANDY FROM BABY UNICORNS. The king advertises for brave knights to rid the walled city of this threat to civil deportment, but the run-of-the-mill heroes all fail. Dragon continues in his deplorable behavior. SNAP! CRASH! DRAGON LANDED WITH A THUD ON THE GROUND. "WOULD YOU LIKE TO HEAR HOW THE STORY ENDS?" THE BOY ASKED. 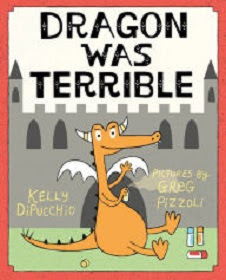 It seems even impudent dragons delight in a good story, especially one with a hero dragon, in Kelly DiPucchio's latest, Dragon Was Terrible (Farrar, Straus and Giroux, 2016), With the help of noted artist Greg Pizzoli's comic cartoon characters, kids will laugh at this rude dragon, a perfectly awful spoiled preschooler type, who nevertheless falls for a good storyline, turning the page on beastly behavior for his inner dragon. "This is one terribly good dragon tale that will leave readers laughing," says Kirkus in their starred review. SHE MARVELED AND MULLED OVER WHAT SHE SHOULD GET. INSTEAD OF MAGNIFICENT, MOST WERE HUMDRUM. Martha ruminates mightily over most of the assemblage, but out of the scrum of mongooses and meerkats and manatees out there, she makes up her mind--A MOOSE! If one moose is magnificent, Martha muses, more would be sublime! And for Martha it seems that there is always room for one more moose--that is, until one day the mob of moose run amok and Martha realizes that what she has is a moose melee'! Her herd has reached ... ... CRITICAL MASS! HMMMMMM! Buyer beware! 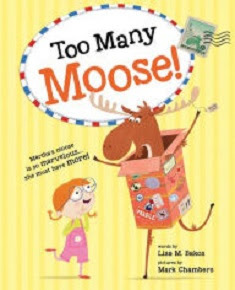 Martha is immediately reminded that there can be too much of a good thing, in Lisa M. Bakos' mooseholic fantasy, Too Many Moose! (Sourcebooks/Jabberwocky, 2016). in which Martha discovers the the mail truck runs both ways and that, after all, a mono-moose is the best pet of all. With a humorous rhyming and alliterative text that makes the most of M words, Bakos recycles the old trope of the Midas touch, presumably in Martha's modern case something more like Amazon Prime! Mark Chambers musters up merry manic illustrations of the mayhem that myriads of moose magnify in the fun of a tale with the much-made moral that enough is ENOUGH. "Many moose mean much merriment—or do they?" asks Kirkus Reviews, and in this instance, they do. "I THINK IT IS," MAMA AGREED. "TIME FOR WHAT?" ADRI ASKED. There comes a time when Mama and Papa feel it's right to share some wisdom with their small fry, and for little fishie Adri, it's his turn. He listens thoughtfully to his parents. and then sets out on his own to try out their precepts. Adru meets a pretty little fellow fish, and they hit it off right away, and the two of them together continue the quest. "BLEND IN WHEN YOU NEED TO." Adri and friend swim with a passing school of colorful fish. But Mama and Papa point out that he also should stand out from the crowd when the opportunity presents itself. They tell their little one to cherish the beauty he sees everywhere, and point out that it is all around him, from the stars above to the depths of the sea. 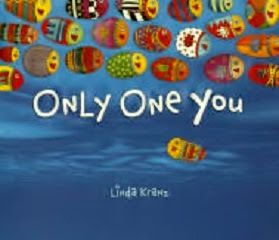 In her newly minted editon of Only One You (Linda Kranz Series Book 1) (Rising Moon Press, 2016) Linda Kranz sets her life lessons off with fascinatingly individualized but abstractly stylized fish, in artwork that is so captivating that people of all ages will be drawn to it right away. The little life lessons which Ari models are good advice, but the chief appeal here is in the lovely illustrations. Kids who love the movie Finding Nemo will immediately get the premise of this little book. A good gift book for any of life's milestones, stressing the uniqueness of each individual and the wisdom of experience, this one also functions as a beautiful picture book experience for all. TO SEE IF EVERYONE'S GONE. It's closing time at the zoo, and Big Jack the Keeper is ready to lock up, but two stealthy kids are readying themselves to be moles, not the dirt-digging kind, but the espionage sort. As the zoo-goers head out the gates, they position themselves to spy on the animals at night. And they are in stakeout position just in time. There's a full moon rising and Big Jack broadcasts the call. THEY'RE GONNA CUT LOOSE! FOOTLOOSE! SLIP ON THEIR DANCING SHOES. D. J. Elephant plays funky hip-hop, and Big Jack is a regular jumpin' Jack Flash with the wolf pack in tuxes and top hats as his backing group. Llamas in leotards plie' and rhinos do the bump. Giraffes glissade in tutus, and camels shake their humps. Ducks do the waddle, and it's time to lose those blues! 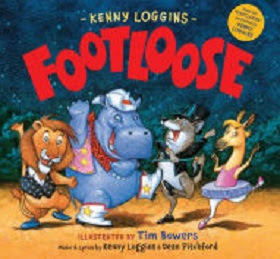 Whatever your terpsichorean preference, from the tour jete' to twist to the toddle, this is the night to strut your stuff and boogie your woogie., and even the young secret agents can't resist shaking their booties a bit with the zoo critters. ALL LEMMINGS LOOK ALIKE AND, SOUND ALIKE, AND ACT ALIKE. But Larry is a lemming who marches to a different drummer. In fact, instead of squeaking, he plays the bongos. Instead of tunneling underground, he swims with the seals. When the other lemmings munch on moss, Larry orders pepperoni pizza. YES, THIS LEMMING WAS AN ODD DUCK. While the other members of his species prepare to leap off the cliffs, Larry spends some time with the puffins on the precipice, but finds that is a cliffhanger. SHOULD ALL LEMMINGS BE THE SAME? Yes! comes the common consensus of his species. Poor Larry decides to try to live with the polar bears. But he soon figures out they want to have him over for lunch--and not as a guest! It's hard being an outlier among the lemmings, who seem to live for that last leap! But this little iconoclast figures that the only way to save his species from their own folly is to become their leader! Can Larry transform his species? 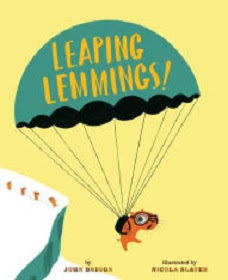 That's the issue in John Brigg's Leaping Lemmings! (Sterling Books, 2016). In this humorous look at the issue of nature vs. nurture, Larry gives it the old college try in this light-hearted look at changing lemming nature, in a slight spoof at the difficulty of changing human nature as well. Like most human reformers, Larry's results are mixed, as Nicola Slater's inspired comic illustrations portray so well. "Hilarious storytelling is coupled with equally hilarious scenes," says Booklist. While Mervin seemingly stands motionless, monumental block letters drop one by one onto the page, stating that Mervin the sloth is about to do the best thing in the world. Clearly Mervin is not the most demonstrative of buddies, but his friends are intrigued. Raccoon is impressed with Mervin's cool promo. Just then Bird soars into the scene and with a THWACK collides with the giant M.
"WHO PUT THESE LETTERS HERE?" Immediately Raccoon and Bird begin to speculate about what best thing Mervin is about to do. Bird declares that it is, of course, flying, but two gophers pop out of their burrows and declare that the best thing is definitely digging. Gazelle leaps about the page and demonstrates his choice--gazelling! Bird doubts there is even such a word. Soon there is a crowd of curious critters in a crush around the apparently still sloth--all speculating just what amazing deed Mervin will do. Will he do all their homework? Invent the way-back machine? They mill around, gesturing and postulating. But Mervin's pals can't perceive any progress toward the occurrence of the purported Best Thing any time soon. They gradually drift off to pursue their own passions, flying, digging, and gazelling, whatever that is, all but the stalwart Red Panda. It's a moving experience, and for Mervin the Sloth that's a big deal! 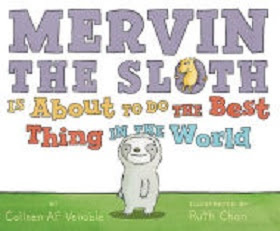 Red Panda perseveres and is rewarded in the fullness of sloth time, in Colleen AF Venable's new Mervin the Sloth Is About to Do the Best Thing in the World (HarperCollins, 2016), earning himself the payoff for his patience. Author Venable pared-down narration builds the suspense, but the payoff for the reader lies in artist Ruth Chan's deliberate draftsman-like drawings. Very observant readers may perceive infinitesimal changes in Mervin's seeming immobile body on each successive page, as slowly, S-L-O-W-L-Y, his arms rise to get ready for the best thing in the world. To get a hug from a sloth takes time, but apparently it's worth it. All things come to him who waits, and persistent and sharp-eyed primary grade readers will get the last big laugh. "...[The] cartoon choreographing of the argumentative cast crackle with silly energy," remarks Kirkus Reviews.